Miss Edna's Place: Just Fifty Nine Days Till Florida! Good morning. Temps are up a bit today. Tis 37F degrees, working towards the low forties. It's gray and wet at the moment, but it looks as though the sun is trying to shine down on us. And, my heat is back on! Woo Hoo! It turned out to be a whole day job. The workers showed up at 7:45 a.m. and did not leave until well after 5 p.m. There were four men working, one being the electrician. By 5 p.m. we also had hot water again. You just don't know how much you need the hot water until it is gone. Last night I did make a big pot of spaghetti and meat sauce, but DIL Janet was not here to help me eat it. I had texted her earlier to let her know that we had no heat and that I did not know what time it would be back on. We figured it would be best for her to come next week. The last thing either of us needs right now is to catch a cold. I got really chilled, but last night I got out the Alka Seltzer and made myself a drink of that. I had a little heater, plus my electric blanket to help Pogo and me with the cold during the day. I'm trying to stay healthy because in fifty nine days, Pogo and I will be in Florida. Woo Hoo! This year I need new tops to wear and probably some new Bermuda shorts. So, I'm hoping to do a bit of shopping while we're in Florida. Even if it means sending my new clothes home in a box, that's okay. I don't take my big suitcase with me anymore. It's too heavy for me, so I'm learning to pack lighter and mail whatever doesn't fit in the suitcase. I washed one of Pogo's little portable houses so that I can pack it in my suitcase. He loves to have little places to take naps in. The little house and a couple small blankets will make my little guy one very happy little kid. This week I want to do some serious airline ticket shopping. I'll feel better knowing that our tickets are secured and paid for. Next month, I'll reserve the rental car. This year I'm really looking forward to going to Florida. I just have to decide on whether to take Pogo's stroller or my walker. If I take the walker, I'll be needing to buy a new folding basket to put on it for Pogo to ride in. He has a basket now, but it does not fold up. I'm concerned that if I take my walker with this basket on it, the basket will get bent or broken when it is put into cargo on the plane. Ah, such a problem to think about!! Do you love chickens? I found these two adorable chicken items on the web and wanted to share them here. 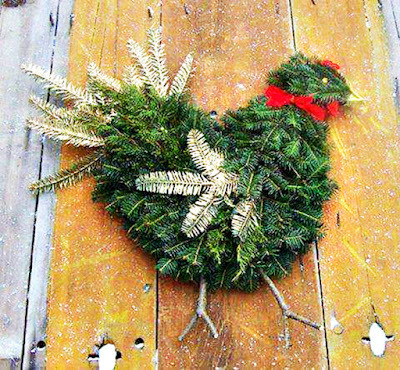 This first one is a beautiful chicken wreath for your front door. 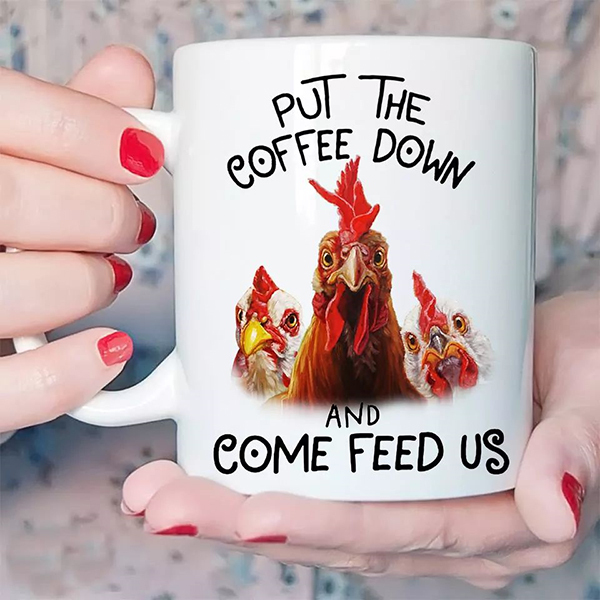 The second item is a chicken mug to inject a bit of humor into your morning coffee. We have a house cat, and a lot of my friends and family have cats. This next image is to remind us that there are a lot of kitty cats out there in shelters that are looking for their forever homes. 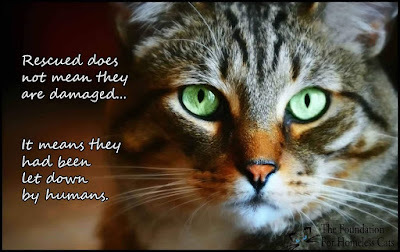 So please remember, don't shop, ADOPT. Now I'm going to get a fresh cup of coffee and do a bit of blog reading before starting in on my household chores. So, till tomorrow, Y'all have a fantabulous day. So happy to hear that you have heat. That is great news. One less thing to worry about as well. I had Nathan to open my vent in my bedroom last night. I usually like sleeping in a cold room but old man winter has had me reaching for my little electric throw and more blankets on my bed. We got up to 30 degrees yesterday. But the nights were in the 20's. That was just too cold for me. We will have a high of 41 today. It is hard to believe that it is just a few short 59 days until Florida! It is always the highlight of the new year to start planning for warmer days and a bit of relaxing sunshine.